Anyone who thought that F1 couldn't possibly be made to look any worse today, that today would be the start of the healing process, and that those in positions of influence would start to introspect, reflect and allow the sport to move forward from the difficult position it had got itself into in recent days, would have been sorely disappointed had they watched today's Bahrain Grand Prix qualifying session on television. 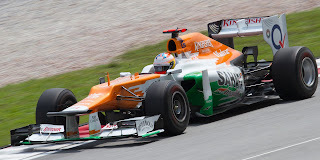 The Force Indias, after missing the second practice session yesterday by altering their itinerary due to safety concerns (related to some of their mechanics being caught up in a violent protest), did indeed participate in the qualifying session today. Indeed, they did well: Paul Di Resta got into the final qualifying session and will start in tenth place on the grid tomorrow, with team mate Nico Hulkenberg thirteenth. But you'd never have known any of it. This is because, as far as anyone could tell, the team got literally no television coverage during the session. And everyone noticed; word of this spread around the internet in minutes. By the end of the session it seemed to be the only thing anyone was talking about. I'm not one usually to go in for conspiracy theories, but this seemed transparent, and probably it represented revenge from the top for the Force India team raising, and acting on, the safety issue yesterday. Healing it seems isn't Bernie Ecclestone's style. Quite why anyone at FOM or anywhere else thought this course of action was a good idea is not clear. Perhaps in the olden days they might have just about got away with a blackout of a single team, but in this age of saturation television coverage, and of the internet and social media, everyone noticed and word went around the internet like wildfire. And those looking on almost without fail saw it for exactly what it was: petulant, childish, despicable. And from this considerable damage to the brand equity of the sport that they're supposed to be promoting (and at a time when the world is watching more than usual) presumably awaits, over and above the damage done already. So ultimately, they lose whatever happens. And for the sake of Force India, a tidy, competitive racing team, I hope that as far as FOM are concerned the matter will rest here, rather than turn into a vendetta. The case also sheds some light as to why F1 teams, and their drivers, have been so reluctant to express an opinion on the issue of F1 being in Bahrain. This is also all an incredible pity, as on track it was another diverting qualifying session. And the real story of today's qualifying should have been all about Sebastian Vettel and Red Bull bouncing back to the front of the grid, a place they know well. Red Bull it seems have got their mojo back, for this weekend at least. The car is sticking on the turn-in in a way that it hardly did in China. Whether this is because they've found something, or that the track layout and higher temperatures suit them, remains to be seen of course. But both driver and team are way too good to have been down for long (as I argued on here a few days ago). The Red Bulls had given indications that they were back all weekend, as they lapped at least near the McLarens and Nico Rosberg at the sharp end for the most part. 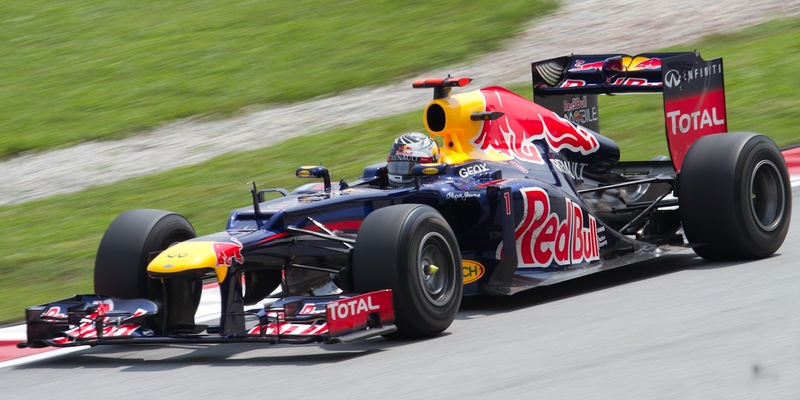 And in the final, vital, session today Seb surged forward and claimed the pole in the final breaths. It was just like 2011 all over again. This gives us a fascinating set-up for tomorrow's race, and we'll see if, again just like in 2011, Seb can control the race from the front. But he'll have plenty to think about: both McLarens, his team mate Webber and Rosberg lurk just behind him on the grid, and all will be optimistic of their race chances. There is also the tyres issue. The Bahrain track is tough on them and Pirelli have been aggressive in their selection of compounds (soft and medium). And the race remains an unknown for the rubber - it's Pirelli's first time here as well as the first time this track configuration has been used by F1 since 2009. And the qualifying session contained plenty of surprises. As is often the case at Bahrain, the times tumbled rapidly as the dusty tack was 'cleaned' by the circulating cars. This, in conjunction with a dud DRS, caught Michael Schumacher out in the first session as he sank into the drop zone at the last while he was sat in the pit lane (and both McLarens came oh-so-close to the same fate, and as far as we know they had no technical mitigating circumstances). And, despite the Lotuses looking strong, Kimi Raikkonen was squeaked out of the top ten, in another tight session wherein he was only half a second shy of the quickest time. Daniel Ricciardo delivered a result that the Toro Rossos have been threatening all year by qualifying in sixth. And Fernando Alonso performed another minor miracle to get his Ferrari into the top ten (he'll start in ninth), this at a track designed it seemed to not suit the F2012. But even with all of this, it's hard to escape the suspicion that even if F1 exists for another hundred years, the 2012 Bahrain Grand Prix meeting will be seen as one of the most shameful chapters in the sport's history.